Women can enjoy a wide variety of winter hat styles that are not only functional but also fashionable. With so many styles and colors available, it won't be difficult to find one (or several) that will suit your needs as well as match your favorite winter coat. During the winter season, hats can be found everywhere from department stores to ski shops and they are widely available online throughout the year. Stylish hat styles to consider for your winter collection include knit styles, berets, cloches, fur hats, and fun trendy looks. Women's Triple Cable Pom Beanie: From The North Face (around $30.00), this acrylic beanie offers the casual, slouchy fit that looks so cozy with a fall or winter wardrobe. This one comes in seven colors, six of which have a matching pom-pom (the Lunar Ice Grey has a hot pink pom-pom). Fox Fur Pom Beanie: Macy's offers this more fitted beanie, available in black/emerald green or black/royal blue for around $150.00. It's a wool/acrylic blend that features a fox fur pom-pom. Wool Beret: Forever 21 offers an inexpensive beret option at less than $15.00. This classic style of beret is less slouchy than some styles and is 98 percent wool and 2 percent nylon. It's available in black, green, camel, and red. Betmar French Beret: This stylish one size fits most beret from ShoeBuy is priced at just over $30.00 and comes in colors such as white, chocolate brown, winter white, navy, black, red and pink. It is made of 100 percent wool and is sure to keep you warm while looking sophisticated. In Cloche Proximity Hat: This cute wool cloche from ModCloth is right around $30.00 and features knit flower appliques to dress it up. It only comes in black, but it'll be right at home in almost any winter wardrobe. Braid Band Yarn Cloche Hat: This fashionable cloche can be found at Target for less than $20.00. It too is only available in one color (tan with black ribbon and buckle), but because it is neutral in tone, it will go with just about anything. Because of its simple style, it will pair well with everything from jeans to winter dresses. Coyote Fur Aviator Hat: This cozy hat, found at Macy's for around $650.00, features genuine leather and fox fur, and it ties under the chin. One drawback to this hat is the need for professional cleaning. Faux Fur Russian Hat: From Fur Hat World, this Russian style hat is priced under $50.00 and is done in a buff beige faux fur. It is available in sizes small to large and features ear flaps, a quilted lining and suede leather ties. This hat will not shed and is made to keep you warm on the coldest days. Light Up LED Beanie: This is an inexpensive, fun choice for a winter hat, available at Extreme Glow for less than $10.00. It features seven bright, flashing LED lights in a mix of red, green, and blue. 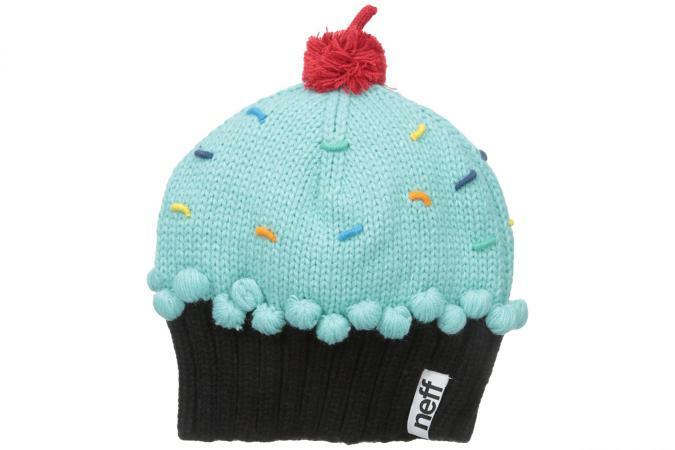 Neff Cupcake Hat: Find this acrylic cupcake-inspired beanie at Peter Glenn for under $30.00. Choose from turquoise or vanilla, topped with sprinkles and a cherry. It's sure to be a conversation starter. Enjoy wearing your winter hat while you can. Just like coats, winter hats aren't meant for year-round wear. Create a total look with all of your cold weather accessories, including scarves, gloves and boots. Finishing off your ensemble with the right hat gives you a sophisticated or fun edge that will make you unforgettable.